(CBS News) With the general election now officially under way, two new surveys show Republican Mitt Romney has closed in on President Obama, setting up a fierce fight for the White House. In a Gallup/ USA Today poll of 12 swing states, Mr. Obama edges out Romney 47 percent to 45 percent -- that's within the poll's four-point margin of error and closer than Gallup's last swing state poll from March, when Mr. Obama held a nine-point lead. On the critical issue of the economy, Romney has the advantage: In a direct comparison, 47 percent said Romney would do a better job managing the economy, while 44 percent said Mr. Obama would. As many as 60 percent said Romney would do a good job or very good job as president handling the economy over the next four years, while 52 percent said the same about Mr. Obama. When it comes to who is more likeable, Mr. Obama beats Romney by a solid 27 points. USA Today points out that the candidate viewed as more likeable has won every presidential election since 1980. By a margin of 10 points, voters say Mr. Obama is more likely to care about the needs of people like themselves. The states surveyed by Gallup and USA Today included: Colorado, Florida, Iowa, Michigan, Nevada, New Hampshire, New Mexico,North Carolina, Ohio, Pennsylvania, Virginia and Wisconsin. 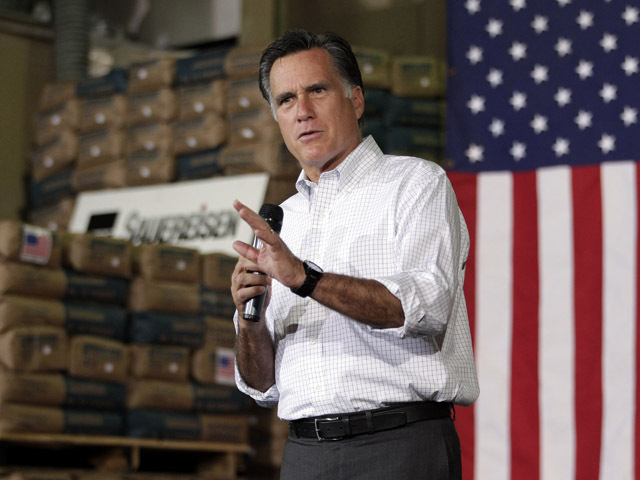 A separate poll released Monday by Politico and George Washington University gives Romney a slight edge among likely voters, with 48 percent to Mr. Obama's 47 percent. As in the Gallup poll, Romney has erased the lead Mr. Obama previously held -- in Politico's February poll, the president led by nine points. In this new poll, Romney has a 10-point lead among independents and a six-point lead among those who say they are "extremely likely" to vote in November. Voters in the Politico poll appear split over who would do a better job handling the economy: As for who would do a better job on the economy overall, Romney leads, 48 percent to 45 percent. But when asked who would specifically do a better job handling job creation, voters slightly preferred Mr. Obama, 48 percent to 46 percent. The Politico poll shows that by a 10-point margin, more voters think Mr. Obama shares their values (50 percent to Romney's 40 percent). After officially kicking off his re-election campaign at a set of rallies on Saturday, Mr. Obama on Monday released a new, minute-long ad that takes a hopeful tone, called "Go." The ad reminds voters of the challenges the nation faced at the beginning of the president's term and touts the revival of the auto industry, the end of the Iraq war and the beginning of job creation. "We're not there yet...it's still too hard for too many," a narrator says. "But we're coming back. Because America's greatness comes from a strong middle class. Because you don't quit. And neither does he." The ad will air in the key states of Virginia, Pennsylvania, Ohio, Nevada, New Hampshire, Iowa, North Carolina, Florida and Colorado. In response to the ad, Romney campaign spokesperson Amanda Henneberg said, "Americans will hear a lot from President Obama in the coming months, but what they won't hear from him is the fact that his policies have wreaked havoc on the middle class. After a doubling of gas prices, declining incomes, millions of foreclosures, and record levels of unemployment, Americans know they're not better off than they were four years ago."